NEW DELHI: The Indian government and military is under severe criticism after their lies were exposed as the US-based Foreign Policy magazine said Pakistan’s all F-16 combat jets have been accounted for. The report, citing US officials, contradicted an Indian Air Force assessment that it had shot down one of the jets in February, reports Geo News. "IAF (Indian Air Force) claim of hitting F-16 by their Mig-21, before having been shot down by PAF (Pakistan Air Force) gets exposed," said Major General Asif Ghafoor, director general of the Inter-Services Public Relations (ISPR), in a tweet. Two senior US defense officials with direct knowledge of the situation told Foreign Policy magazine that US personnel recently counted Pakistan's F-16s and found none missing. The US report is a further blow to Indian Prime Minister Narendra Modi, who had said that India had taught Pakistan a lesson. Indian Supreme Court lawyer Prashant Bhushan said the US has proved the Indian claim of downing the Pakistani F-16 as wrong. He said the satellite images belied the claims of killing Jaish militants in Pakistan. He said Indian own helicopter was downed and six people died, its plane was destroyed and pilot captured, but still the ‘56-inch chest’ is still beaten. Siddharth Varadarajan, the founding Editor of The Wire news website, called it a “big blow to post Balakot account” of Prime Minister Narendra Modi. 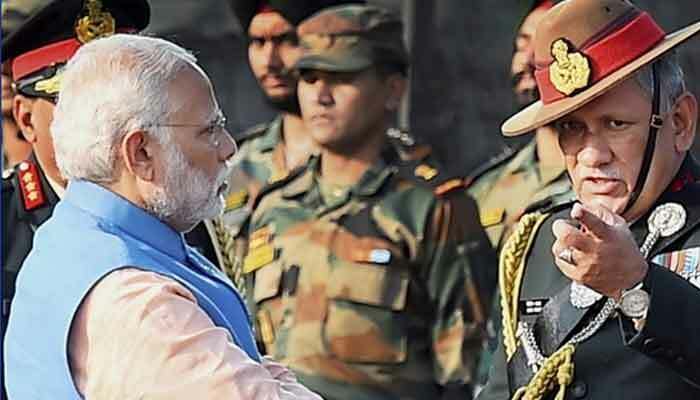 “So this a big blow to @narendramodi’s account of the post Balakot clash: US Counted Pakistan's F-16 Jets – and Found None Missing,” he wrote on Twitter. Filmmaker Rakesh Sharma called the entire episode starting with the Balakot misadventure to the aerial battle with Pakistan “a hasty op sans enough prep? For 56 to get ‘action’ before elections? !” Writer and photographer Sanjukta Basu said that India has become a laughing stock during the rule of Premier Modi. “First time in our history we are a laughing stock. USA: India is lying they never shot Pak F16, NASA: India's hooliganism for votes created debri in space. Irresponsible. Global economists: India hiding/manipulating data. Pak: Indian PM is like Quixote tilting at windmills,” Basu wrote in a Tweet. Former Indian foreign minister Shashi Tharoor also poked fun at Modi for his false claims. We lost one fighter jet, and probably shot down own chopper. “No satellite images proving Balakot strike. Got our pilot captured and claim of striking down F-16 turns false. And @RXordana says Modi's Sena is giving befitting reply to Pakistan,” he said. However, some Indians preferred to remain in fool’s paradise and refused to admit that they have been fooled by their government. Gaurav Arya, a retired Indian army major, said it was difficult for the United States to admit that an obsolete MiG 21 had shot down a much superior flying machine. “For America, war is a multi-trillion dollar business & the F16 is a global brand. There is no way the US can ever admit that a MIG 21 shot down an F16. It will bury the brand for ever & will raise questions on other US weapon systems. Embarrassing for US,” he said on Twitter. But Christopher Clary, Assistant Professor of Political Science, University at Albany, had an informed answer for them. “Some people say the US knows it lost an F-16 but can’t admit it for commercial/pride reasons. Let me just say that Pakistan has many enemies in the US bureaucracy and even more on the Hill, and I think if Pakistan lost an F-16 they would gleefully leak it,” he tweeted. While Michael Kugelman, Deputy Director at Asia Program and South Asia Senior Associate at The Wilson Center agreed with Clary. “Agree completely. Had a Pakistani F-16 really been shot down, someone in USG would have been happy to leak/admit it,” he tweeted. A defence editor at NDTV speculated that the downed F-16 might have been from Jordan, not from US. He said IAF has a lot to explain in this regard. The UK news agency Reuters has reported that the Foreign Policy magazine report will be a big jolt for Modi if it is authentic. On the other hand, the IAF is not willing to accept the Foreign Policy report and is adamant that its claim is true.